If you're looking for that little extra Valentine's Day present then look no further than this sensational cookbook. 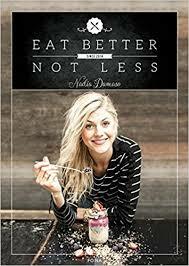 'Eat Better Not Less' by Nadia Damaso is not a new book but has been published for the first time in the UK. Nadia is from Switzerland and her book of 100 healthy and satisfying recipes was first published in mainland Europe in 2015, but now we Brits can enjoy this original and exciting cookbook. In 'Eat Better No Less' the author proves that by eating the right ingredients, you can look and feel fantastic without sacrificing on flavour. Featuring over 100 quick and tasty recipes, Nadia shows that with a little bit of planning, it's easy to embrace a healthy lifestyle. And we all want to do that! Her philosophy is simple: food that's good for you needn't be boring or leave you hungry. Start the morning with a bowl of creamy Vanilla Porridge or a guilt-free Banana Ice Cream and you'll be full of energy for the rest of the day. For lunch, Avocado Pizza makes a delicious feast, and the Sweet Potato Burgers are perfect for weeknight dinner with friends. There's even room for treats: try the decadent Amaranth Hot Chocolate, a light Banana Chia Cake which makes the perfect snack, or a rich and satisfying Nougat Cheesecake. With dishes for meat-eaters, vegetarians and vegans alike, 'Eat Better Not Less' is a bible for anyone who loves nutritious flavoursome food. I couldn't put this new cookbook down when I discovered it last weekend, and when I saw the price of only £15 ($24.99) for a beautifully presented hardback publication, I rushed to the checkout. So many different and refreshing recipes, where do you start? At breakfast? There is certainly plenty of 'start the day' choices - I counted 32, that ranged from many different porridge's, through shakes and smoothies, to breads and cakes. I loved the Creamy Vanilla Quinoa Porridge With Berries and the Spelt Waffles with Almond and Berry Cream looked sensational (below). Nadia Damaso is only 21 years old and grew up in a region of the Swiss mountains called Engadin and she is not only passionate about cooking but taking pictures too, so hence this book is briming with all her own photos of her recipes. A talented young lady. She tells the story of the book in her introduction and it is a fascinating read - from first concepts to the finished product. She covers the philosophy behind the book and takes the reader into he own kitchen to see her food cupboards, tools and superfoods. Please don't be put off by the books title - it's for everyone, not just the 'trendy and healthy young things' which you might think. 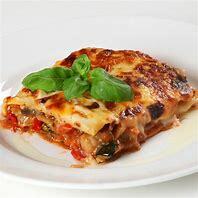 Main Dishes and Snacks cover pasta, meat, fish, burgers and salads, while the Desserts allow you to indulge yourself with muffins, pancakes and the classics like Chocolate Cake. This book is very different from most cookbooks - from start to finish it is inventive, creative and inspiring. Where does one start - will be your question? Will it be the Fusilli with Kale and Mint Pesto, the Sesame-Crusted Tuna with Broccoli Lime Cream or Beef Tenderloin with Plum Blackberry Sauce and Garlic Mushrooms (below). If you want to eat healthily without giving up the food that you love, then this book will show you how through a range of sensational and original recipes. It's now on the shelves of your local bookshop, so go get it today. 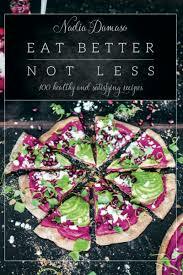 'Eat Better Not Less' by Nadia Damaso is published by Hardie Grant Books (2017) at £15.00 in hardback (ISBN: 978-1-78488- 092-7).